Fire and ice have crashed together at the edge of the world for a stunning performance, captured by RT’s Ruptly agency. The Holuhraun lava field has spread across an area greater than the island of Manhattan in the largest eruption since the 18th century. Iceland’s largest glacier, Vatnajökull, became the venue for an amazing natural phenomenon on August 29, when lava began making its way through its northern fissures. Now, it has become a largest eruption since the Laki in 1783-84, which killed 20 percent of the island’s population. At the beginning of January, NASA estimated the scale of the lava field as more than 84 square kilometers, which is 1.3 times larger than the island of Manhattan. However, the most densely populated New York City borough leaves little space for comparison, as the Icelandic Highlands in the northeastern region is scarcely populated and remote. Still, evacuations have been carried out regularly in the area to prevent tourists and hikers from getting poisoned by the sulfur dioxide, the toxic gas emitted by Holuhraun that is life-threatening. 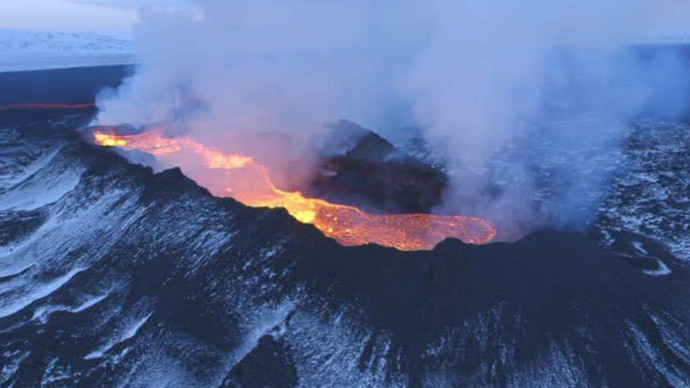 Scientists from the University of Iceland’s Institute of Earth Sciences have measured the thickness of the Holuhraun lava field. On average, the eastern part was about 10 meters thick, the center was 12 meters deep, and the western part was 14 meters. Preliminary analysis, based on data from surveillance flights, put the volume of lava at 1.1 cubic kilometers. The magnitude 5 or higher earthquakes that were occurring on a daily basis are now much more seldom, at about one a week. “This doesn’t mean that the eruption will stop soon. Like the weakening spray from an aerosol can, the eruption rate declines exponentially. The lower the flow, the more slowly it declines,” said Stevenson. According to some predictions, lava could continue to flow for years.